“The video mics were used at two meetings last month, for 30 and 60 participants respectively “ says, Andrew Murphy, Director of Rental Operations at Conference Rental, “The participants felt very comfortable with the unit. They enjoyed the added functionalities available at their seating position including electronic voting, and most of all the ability to view the meeting content right in front of them instead of on a distant screen”. The 10” display on the conference unit, with 1280 x 800 high resolution, offers a more comfortable viewing experience for users along with brighter and more vivid images. Meeting moderators can chose to display any presentation materials including PowerPoint or videos, with the possibility to switch between up to 8 HD-SDI video sources for display on the video microphones using the HD video matrix switcher. First unveiled to the public by TAIDEN – a lead manufacturer of conference microphone systems – in 2011, the technology combines the traditional features of a conference system (microphone, built-in speaker, electronic voting, language interpretation if needed) with a high-resolution monitor. Packed with exclusive capabilities, the video microphone units remain quick and easy to setup using a daisy chain cabling. A nameplate slot on the back can also be used to identify attendees at meetings. Conference Rental offers the added service to create custom nameplates ahead of the event. 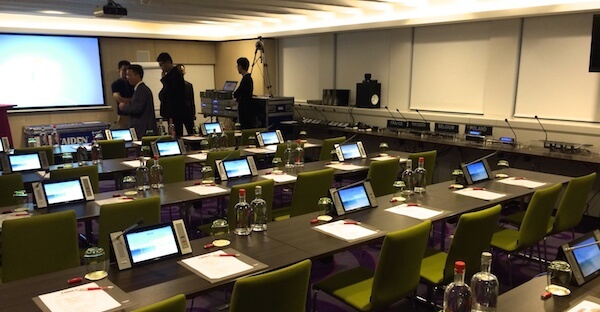 With this new all-in-one technology solution available on a rental basis, meeting planners have more flexibility to implement the room configuration that is desired by their clients to achieve the highest level of collaboration. The video microphone units brought by Conference Rental is truly an innovative AV solution for the conference and events industry.